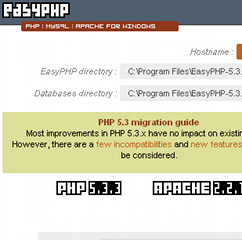 EasyPHP is an incredible tool for web-developers. It is a portable WAMP package; a combination of popular web server packages like — MySQL (open source database), Apache web server, PHP (scripting language) and PhpMyadmin interface which can be locally installed onto your machine. It’s is portable and can be copied to a usb drive too. The entire package is available free of cost under GPL. For Admin, PHP files are stacked in Program files and for the non-admin users, files are stored in My Documents. EasyPHP has some miner quirks because of the Windows architecture, for eg. you must use 127.0.0.1 instead of “localhost” for your sqlserver. Nonetheless a WAMP configuration never came in this handy and portable a package. You can download this handy utility here. A new version of EasyPHP shall be announced soon with more wiser adaptions involved making the task of a web-developer lot easier. The release will have MySQL 5.5.5.1, Apache 2.2.16, PHP 5.3.3 and PhpMyadmin 3.3.7 and new features like Php’s powerful debugging extension the Xdebug and few new managers.